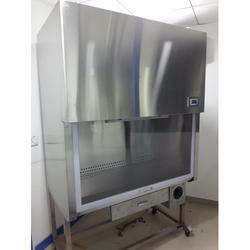 Pioneers in the industry, we offer biosafety cabinet from India. Durable in nature, offered Biosafety Cabinet is quality checked by industry professionals. Reliable in nature, offered cabinets are damage free and easy to place. Rugged free frame having this cabinet is easy to clean. Overall Size of the cabinet should be approximately 1010 x 825 x 2400 mm. Cleanliness level should be less than 3.5 particles/ litre of 0.5 μm and larger. Noise Level should be less than 65 db. Vibration level: Less than 2.3 μm. Average air flow should be 90±20 fpm (down flow). HEPA filters should be MINIPLEAT with 99.99% efficiency for 0.3 micron with integral metal guards & filter frame gaskets and manufactured in class 100 super clean air-conditioned environment for longer life. Air pressurization system should be statically and dynamically balanced, fitted with special vibration reducing system to suit low noise and vibrations. UV lamp should be in working zone (40 micro watts/ square cm at 254 nm or better) and placed so that the operator cannot see directly i.e. eyes should be always protected. Should have Switches & Electrical sockets outlets for 15/5 amp. Should have Switches & Electrical sockets outlets for 16 amp. Suitable power supply 230 volt a/c. CLASS 2 A-2 Exhaust blower should be capable for 30% exhaust 70% circulation interconnected with supply air blower system should only start when the negative pressure.